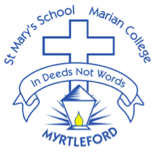 For over 40 years, Marian College has been committed to the rich heritage established by Nano Nagle, founder of the Presentation Congregation. Our College is a community of learners who continue to support and enact Gospel values in the Catholic tradition of our founder. I warmly invite you to visit Marian College. I would be very pleased to show you our school in action and to answer any questions you may have.